The hallmark of the Christian is not one who has no enemies, but one whose enemies cannot disturb their inner peace. In his famous Sermon on the Mount (Luke 6), Jesus taught us that pathway to peace. Like Teresa of Avila’s famous “interior castle,” this pathway is not linear, from point “A” to “B.” It is a maze of steppingstones through a series of rooms that lead to an innermost destination, which is God alone. For most of us, our true enemies are not the nameless faceless on the other side of the ocean. Not even the anonymous, obnoxious commentators who troll our blogs and belittle our beliefs. By this definition, our enemies are those known to us. Therefore, if we are to follow Christ, we must begin by loving those who cause us pain by their proximity. The child whose choices cost us dearly. The associate whose whispered, underhanded machinations are difficult to confront. The “friend” who betrays out of her own self-interest. For all these “enemies,” dear Lord, we pray for peace without and within. 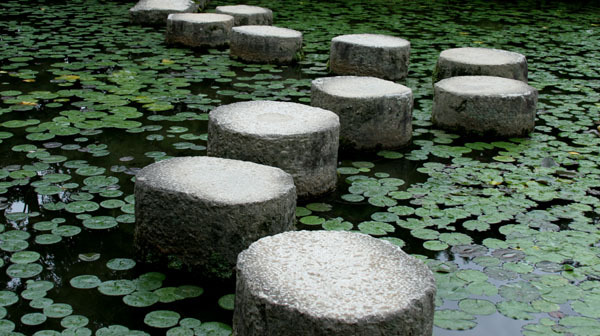 Next, the stepping stone of detachment. We express our loving detachment not just in our thoughts, but in our very actions. For most of us, relinquishing our “rights,” up to and including our physical comforts, is one of the hardest forms of fasting. But it is the true path of humility and detachment, the place God can hear our petitions most clearly. The one who blindly ignores a mess or problem, leaving it for others to handle. Those who take credit for the ideas or efforts of others. Those who take advantage when we have the fewest resources to spare. Lord, for all these “enemies,” we pray for your blessed abundance. And for our own willingness to let go. With the next stepping stone, we take detachment to a whole new level . . . to generosity. The answer is the next stepping stone: Imitate the mercy of Christ with those who know only too well their failings. They don’t need to be reminded of their weaknesses, but of the reason for their hope. Lord, we pray for those who take without giving thought to what it costs us. Help us to find joy in the giving. The final stepping stone is at the heart of all authentic love, which pours itself out not just in giving our possessions, but of our very selves in total self-giving, knowing that the more we give, the more we are emptied. And the more we are emptied, the more we will receive from God’s abundance. Lord, we are grateful for the opportunity to give as you gave, to love as you loved. Empty us of every last ounce of our own effort, so you can fill us more completely out of your abundance. And so, dear Lord, we offer our prayer for mercy. Mercy without and mercy within. Mercy near and mercy far, mercy deep and wide. And mercy for those who will understand only in eternity. Send your Spirit over these troubled waters and burning nations. Illuminated by the Light of the World shining within us. Have mercy on us, and on the whole world. Amen. This entry was posted in pope, prayer, Uncategorized and tagged Interior Castle, Middle East, Pope Francis, Prayer for Peace, September 7, Sermon on the Mount, Syria, Teresa of Avila by heidihesssaxton. Bookmark the permalink.